John Wesley was an English cleric, theologian and evangelist who was a leader of a revival movement within the Church of England known as Methodism. He was born in the United Kingdom in 1703. Here are are some interesting things about this great man. The Methodist Church logo is represented by the cross and flame. 1. John Wesley came from a huge family. John Wesley was the 15th of 19 children. The child mortality rate in 18th century England was very high. Statistics show that 70% of all deaths were children under ten. So it is not surprising that many families had an abundance of children. His mother Susanna (who herself was the 25th of 25 children) lost nine of her children in infancy. 2. John Wesley was a victim of bullying as a child. Wesley who was a short and intelligent boy, was bullied relentlessly as a child. This abuse affected him for the rest of his life. Various accounts tell of how, as an adult, Wesley would tremble when discussing the harsh and terrible treatment, he received from his peers. 3. John Wesley vehemently opposed slavery. This letter was written in 1791, and sixteen years later Parliament finally outlawed England’s participation in the slave trade. 4. John Wesley is one of history’s most traveled men. 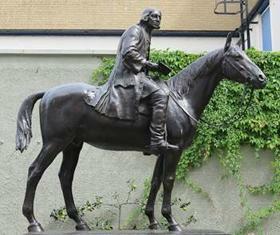 During his ministry John Wesley rode over 250,000 miles on horseback, a distance equal to ten circuits of the globe along the equator. He preached over 40,000 sermons! Some of his best sermons can be found here. 5. John Wesley is credited for coining the phrase “agree to disagree”. Wesley often found himself at odds with George Whitefield, (an evangelist who was also one of the founders of Methodism and the evangelical movement), who shared Wesley’s enthusiasm for evangelism. He clashed openly with Wesley on issues of soteriology (the study of religious doctrines of salvation). Eventually, the rivalry between Wesley and Whitefield’s theologies introduced an impassioned following among their supporters. 6. John Wesley did not intend to form a church separate from the Anglican Church. When the revolution happened in the American colonies, most of the Anglican priests returned home. Since none of the Methodists in the colonies could receive the sacraments, Wesley ordained ministers whom he sent to do the same in America. That act was the beginning of the separation that formed the Methodist Church in America. The Methodist Church in England did not officially form until after Wesley’s death. Click here to view jewelry crafted in the shape of the Methodist Church logo. Wesley was a prolific writer and commentator on Scripture―his collected works fill eighteen volumes―and yet it is commonly held that he was not systematic or consistent in his theology and teachings. On the contrary, authorThomas C. Oden demonstrates that Wesley displayed a remarkable degree of internal consistency over sixty years of preaching and ministry. John Wesley’s Teachings is the first systematic exposition of John Wesley’s theology that encompasses all of his writings. ChristianMetro is one of the best Christian sites that features Christian articles, Christian trivia, easy Bible trivia, Bible Questions and answers. We also feature a Bible book store, Christian clothing, baptism gifts and Christian tshirts in our store section.